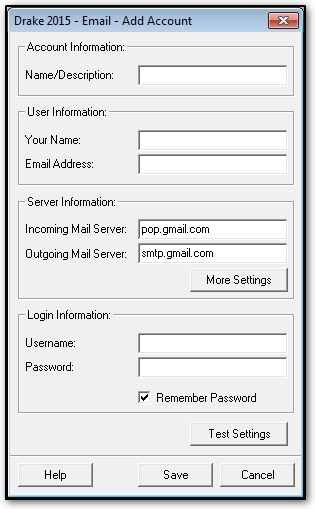 **NOTE 2** - Username is always your full email address. **NOTE 3** - Screenshots below show port 587 ( where it says "click More Settings to open a dialog box") for OUTGOING. 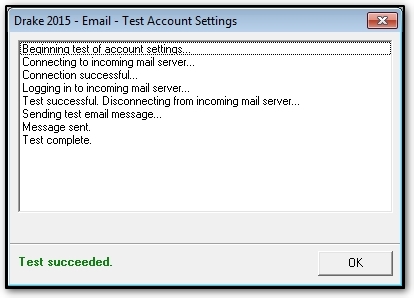 Our settings for mail is 465 for OUTGOING. Also, this should be set to SSL not TLS. So, incoming and outgoing should both be SSL for encryption. You can send email to Drake from return data entry without setting up an email account. To email other recipients from Drake16, you must set up a third-party email account. The 1040.com email account formerly supplied with the software will be available to current subscribers until October 31, 2017. See "Sign Up for Drake 1040.com Email" in Related Links below. 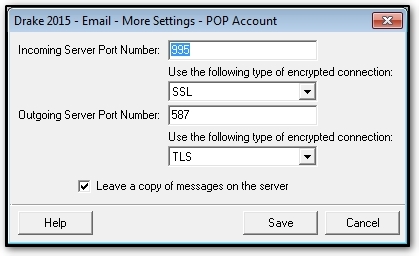 When you complete office account setup, turn the account on by selecting Use Office Email Account(Help > Email > Setup > Accounts). 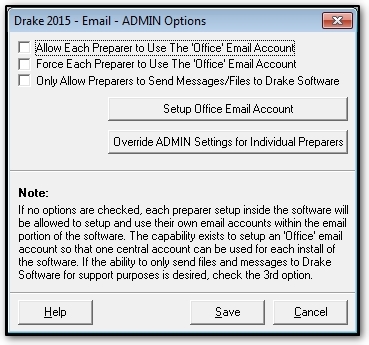 A third-party email account set up in Drake16 can be selected for use in the Drake Document Manager Working or Archive Cabinet. 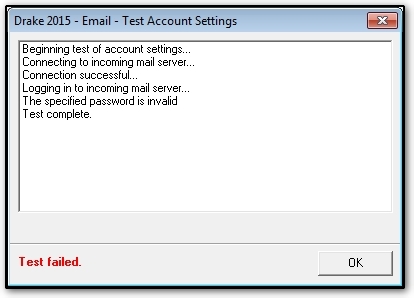 After you select an account type (an email provider) and click OK on the Account Type dialog box, the Add Accountdialog box opens for preparer or ADMIN email, or the Office Account dialog box opens for office email. They are the same except for the dialog box name. The Add Account dialogue box is shown below. If you confirm that all settings are correct, but continue to get Test Failed, contact Drake Support at 828-524-8020 for additional troubleshooting steps.